Taking out the resistor from the circuit and just looking at it individually, a resistors resistance is determined by the factors mentioned in the picture. Resistivity is dependant on the material it is made of. Procedure/purpose: Connect different resistors into the circuit respectively with the ammeter attached as well. 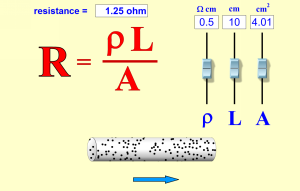 Measure the resistance by the voltage of the power supply and the value shown on the ammeter. Also measure the cross-sectional areas and lengths of each resistor. Use the data to derive the resistivity of the material. Such a chart could be used in compiling the data from the experiment because as you change other values like the cross-sectional area and the length, the resistivity doesn't change. And so the resistivity could be graphed and calculated. The simplest form of a DC Circuit is just like the one shown on the left. Even though simple, it is important to know how the sum resistance differs between resistors connected in series and parallel respectively. Procedure/Purpose: To connect resistors into a DC Circuit in series and parallel respectively with ammeters and voltmeters attached to each specific part of the circuit. 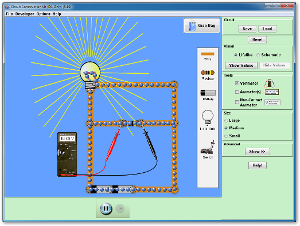 By measuring the value of the currents, voltages and relating them to the voltage of the power supply and the resistors, experimenting and verifying the formulas for series and parallel circuits. Since values like the voltage of the power supply, the resistance of the resistors are already known, and that the currents change as the resistors are arranged, a chart could not be applied to calculate any specific constant. 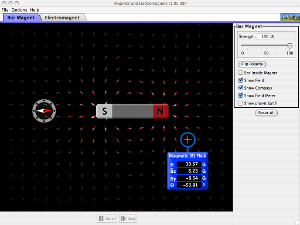 Well...this isnot a full course description of magnetism. Brief Description: This lab does not contain any quantitative calculation, and only involves qualitative experiments. This is utterly due to the lack of my creativity(passion?0.0). Procedure/Purpose: To connect the resistor into the circuit and wrap the cable around the piece of iron in coils while placing one pole of the magnet close to either sides of the piece of iron. By observing or feeling how the magnet is attracted or repelled, you are able to have a better understanding of the right-hand rule for electromagnets.